Made in Markneukirchen Germany. 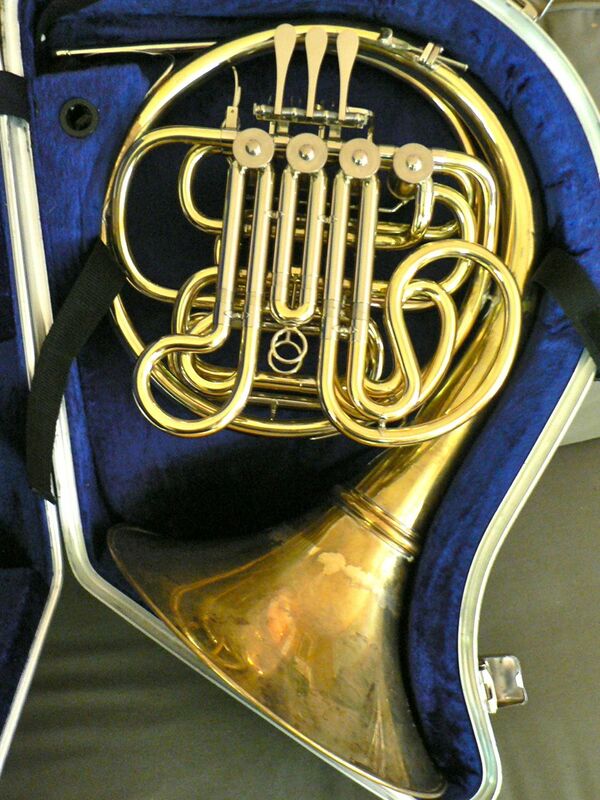 F Schmidt Geyer wrap (VMI) Hoyer stencil Double French Horn. Serial #361510M. “Ready to play!” The horn has a detachable flare with a German B&S ringset, and a Factory adjustable pinky hook. Much of the lacquer has been removed from the bell tail. Yellow brass, lacquered except for bell tail. Gold Brass lead pipe. Nickel inner, outer slides and ferrules, String linkage, except on change valve, which is the Hoyer reversible Bb/F mechanical linkage. It is a terrific horn for a serious young HS, university or any student of the horn. This horn uses the same valve cluster with Oil Ports and the bracing and bends, except the first branch, are all the same as the Hoyer 802 geyer horn. Bore: 11,9 mm (0.468 “), bell diameter: 310 mm (12.205”), medium-throated bell, adjustable pinky hook this horn was manufactured in Markneukirchen Germany, the same factory where the famous Hoyer horns are built. This horn is in very good condition, It has had some minor dent raising on the bell tail, near the bell-brace. This Horn is free blowing, well centered, and has a big open sound for a medium throat horn; the tone color is characteristically that of a brass horn, with warmth and color that a nickel horn lacks. Comes in a factory Case, no mouthpiece. If you desire a detachable bell case, one can de furnished at extra cost. I have several different used detachable cases. In one of these cases this horn can be shipped to countries with the 2m postal limitations. Email questions, Additional Pix are available, but I need an email address to mail to as an attachment. Buyer to pay shipping and insurance. The horn will be shipped via priority mail in an 18 X 18 X 27 inch box @ 21 Pounds, insured. The cost is based the USPS price calculator, which you can access to determine fees to your address or country.